Apparently Mercedes's calculations in advance called it a dead heat. 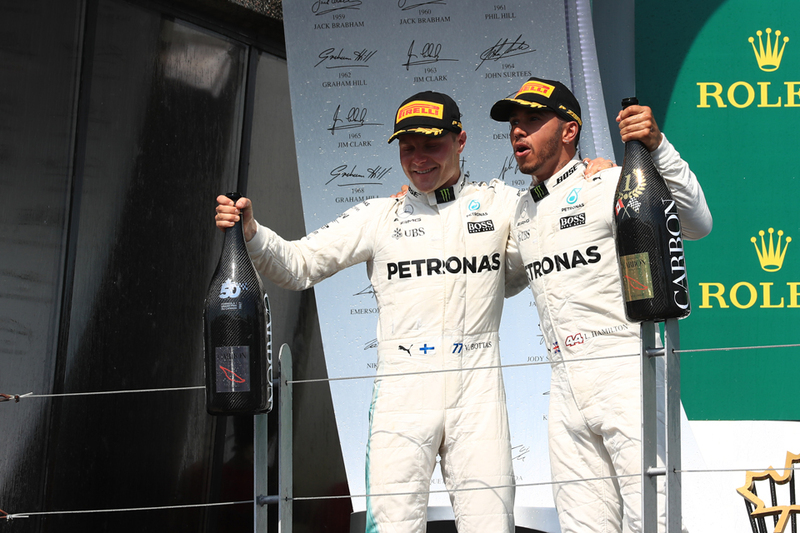 There was, we expected, to be nothing between Merc and Ferrari in this one. We should have known though that things are rarely that simple in Montreal. 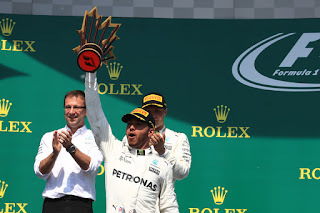 The bald facts are that in the Canadian Grand Prix Merc took an imperious one-two. 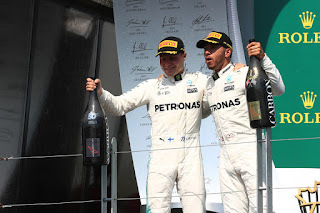 And of its driver pairing Lewis Hamilton made good on his local specialist status by existing in another race, to the point that the TV director appeared to disregard him. Lewis's engineer, not just because of the Ile Notre Dame surroundings, called it a "walk in the park". It was made so from the off. Sebastian Vettel's Ferrari usually is to be feared from the launch but today it wasn't stellar and from second he was mugged at turn one by a racy Valtteri Bottas (who looked for a nanosecond that he might spear his Mercedes team mate) and a racier Max Verstappen, who came from nowhere to sweep around the outside to take second place. Seb thus was fourth and already the race had gone a long way to be framed. It transpired that it was even worse for him, as Max had clipped the Ferrari's front wrong on the way by, and half of it eventually came adrift. Seb pitted after four laps, and emerged 18th. It was the prelude to a fine recovery, but it was also strictly damage limitation. And for the win from then it was a Lewis benefit - in the lead on a track he adores he simply disappeared. After seven laps of green flag racing he was more than five seconds clear, and the trajectory continued almost uninterrupted. As if to underline that Lady Luck was smiling on him, his closest challenger (a relative term) Max dropped out quickly with a battery problem. Lewis even had the luxury of pitting later than most behind. After making his solitary stop on lap 32 he was nine seconds up the road of his stable mate Bottas. Day framed. 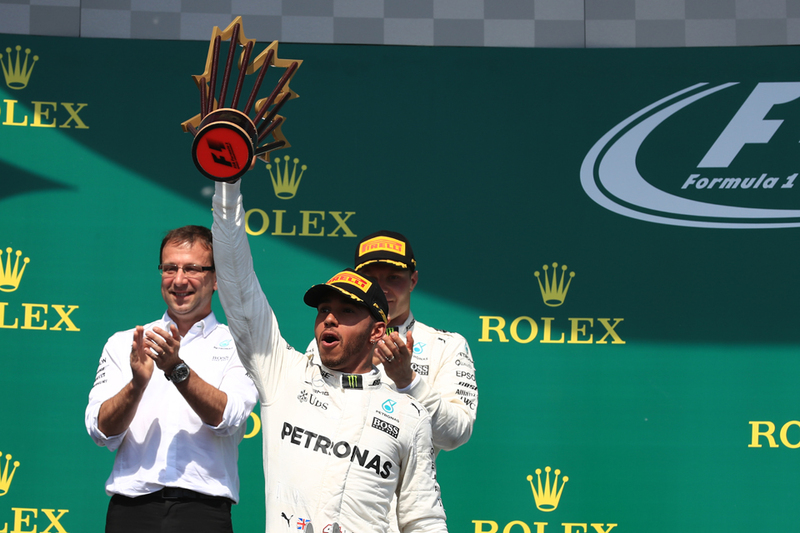 Indeed Lewis continued in the same vein and was just shy of 20 seconds clear at the end. It was his sixth Montreal win. "There wasn't any trouble today, it was a beautiful Sunday drive," said Lewis later, summing things up. "It has been an incredible weekend, I couldn't be happier." And then he got to perhaps the crux of this Canada visit. "To have come away from Monaco, really everyone scratching their heads and wanting to work and pull together, and we did," he added. "In these five years [with Mercedes], I've not seen the team pull so well together and work towards the same cause, to understand the car and come here and deliver what we delivered - a great blow to Ferrari. "The car is back to where it should be. Doesn't mean it'll be like that every time. It should put us in a good position from here moving forwards." He batted away a suggestion though that today was a turning point. "I think today they just had a messier race," he said of the Scuderia. 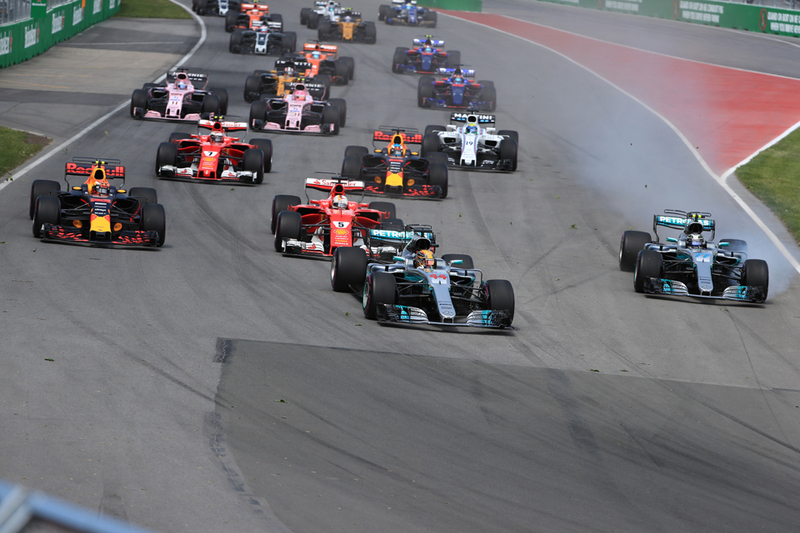 Bottas in turn was well clear of a race-long scrap for third, led by Daniel Ricciardo, followed by Sergio Perez, Kimi Raikkonen and Esteban Ocon. Later the recovering Vettel hooked onto the back of them. For a few glorious laps the increasingly impressive Ocon ran as high as second after others had pitted, comfortably repelling Bottas and not losing much time to those who had fresher boots behind. After his stop he reemerged sixth on much newer tyres than those immediately ahead. After some laps of impasse however Ferrari rolled the dice by bringing first Kimi then Seb in for fresh sets of wheels. Either then lit the timing screens purple, taking a second or more a lap out of the depleted train ahead. We also were treated to a sideshow wherein Force India was minded to let the newer-booted Ocon ahead of team mate Perez, so the Frenchman could attack Ricciardo. Perez refused, and Ocon's fresh rubber advantage was therefore dashed. The Ferraris closed in gleefully, though not long later Kimi dropped back with brake problems. Seb of course didn't let up. In a doleful coup de grace, once caught up in the late laps Vettel was able to ambush Ocon at turn one in brave style to take fifth from him, in part as Ocon had lost momentum for the latest time after Perez had repelled him robustly. 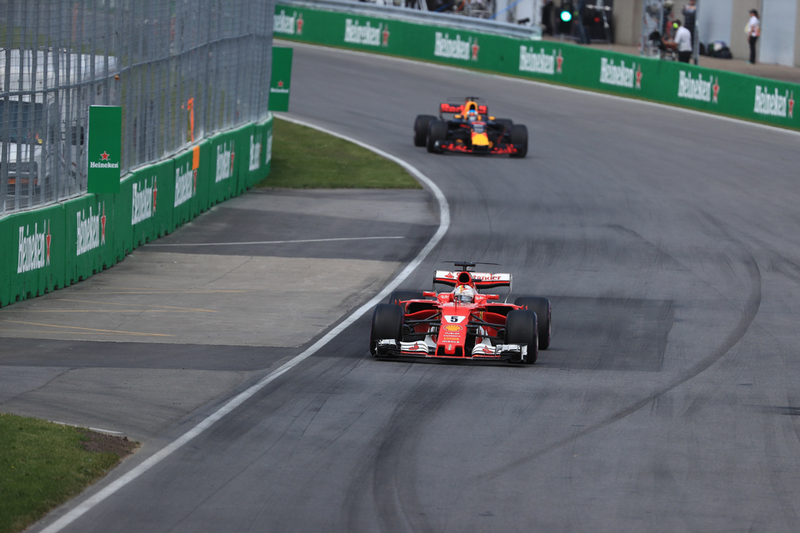 With two laps to go Vettel got down the inside of Perez at the final chicane to take fourth, where he finished (Ricciardo had been able to get himself out of reach as the others squabbled). Ocon continued to attack Perez, literally until the end, but they finished in that order. The intra-squad debate clearly hadn't finished though, and on the cool down lap Esteban sounded rather put out. And perhaps had his team mate's defensive manoeuvres as well as his obduracy in mind. He was graceful in front of microphones later though. My view, for what it's worth, is that while we all admire a determined racer Perez's actions today felt a bit much. It's incontrovertible that it cost the team points. Perhaps it cost a podium. Hopefully the fuss will not deflect too much from Ocon's improvement of which today was just the latest manifestation. 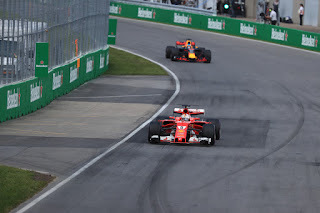 The upshot too is that it aided Seb in minimising his points damage, although just over half of his championship advantage is gone - from 25 to 12. His was a fine aggressive drive, although with Force India gate and Kimi's brakes in that way of Seb at his best things seemed to be smiling on him too (he'd point out with justification though that he was not without bad luck today). "Obviously the beginning of the race didn't go our way," Seb noted, "but I was still believing we could fight back and get a podium. In the end when I came back to that group I was fairly confident. "But yeah, one lap short." While on the first turn incident Seb was sanguine. "Three cars in turn one doesn't work...you don't do that [hit him] on purpose as the chances of a puncture are very high." Raikkonen hobbled home seventh, followed by Nico Hulkenberg and Lance Stroll. Yes you read that right, the pariah Stroll got a couple of points. 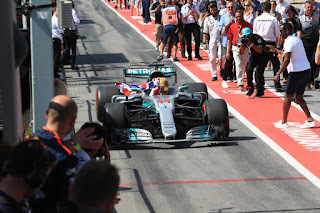 Granted it was a day in which a few top ten slots were cleared out (his team mate was wiped out by an errant Carlos Sainz on lap one) but Stroll's effort was combative and one without obvious error. Fernando Alonso ran in the points throughout and looked good for the final one for tenth, but his engine failed with a handful of laps to go. That point was instead claimed by Romain Grosjean, who in effect did a no-stop run after making his mandatory tyre change under a first lap safety car. You wonder had Lewis not made his mandatory stop if anyone would have noticed. Not that he was in need of skulduggery. He's right to be cautious, and be wary that the car still has diva tendencies. Ferrari yet doesn't appear to have intention of leaving the stage. But he will have ended his Canadian stop off in a much more optimistic mood than when he started it.